Sept. 1 marks the last chance to receive the early-season rate on Tahoe Local, Tahoe Value, and Epic season passes – all of which offer access to the Best of Tahoe resorts, Heavenly Mountain Resort, Northstar California and Kirkwood Mountain Resort. “Our ability to deliver the best snow conditions is unique among Tahoe resorts. Between Heavenly and Northstar’s world-class snowmaking systems and Kirkwood’s well-deserved reputation for receiving the region’s most annual snowfall, pass holders can look forward to a great 2014-15 season,” said Bill Rock, senior vice president and chief operating officer for Northstar California. With the region’s most valuable season pass options starting at $409, pass holders receive access to the most terrain and best conditions in the region as well as fewer restrictions than other resorts’ season pass options. “In addition to proven snow quality, Heavenly, Northstar and Kirkwood offer guests varied experiences of a lifetime that speak to the diversity of each and showcase the partnerships that continue to push boundaries, making the collective value greater and truly the best of Tahoe,” said Pete Sonntag, vice president and chief operating officer for Heavenly Mountain Resort. 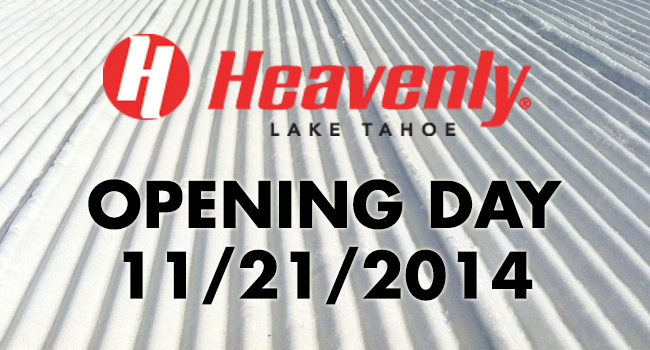 The high-energy atmosphere and experience at Heavenly Mountain Resort is guaranteed to reach a new level during winter 2014-15: Heavenly Mountain Resort, the Park Family and Warner Hospitality announced Hard Rock Hotel & Casino Lake Tahoe will open in late December 2014 or early 2015 in South Lake Tahoe’s casino core. In addition to a 25,000 square foot casino, the property will include more than 500 renovated hotel rooms, new restaurants and bars, the largest outdoor pool experience in South Lake Tahoe, and an assortment of live entertainment venues both indoors and out. Complimentary Champagne Toast. Every Day. Echoing the resort’s penchant for California laid-back luxury, Northstar California invites guests to enjoy its daily complimentary Champagne toast on the slopes this season. Offered every day on the snow at 2 p.m., this new tradition is a nod to Northstar’s casual elegance and the best of Tahoe. As a member of the world’s short list of iconic, big-mountain experiences, Kirkwood Mountain Resort offers skiers and riders the region’s deepest snowpack and legendary steeps. In addition to enjoying the resort’s famously raw beauty and pristine snow quality, guests can experience Kirkwood’s best-of-Tahoe adventure through Expedition:Kirkwood – renowned for offering snow cat tours beyond the resort’s terrain, snow safety education, and guided backcountry tours and camps. The Epic Pass, Tahoe Local Pass and Tahoe Value Pass provide access to the region’s three premier resorts—Heavenly, Northstar and Kirkwood—with the combined 10,270 acres of skiable terrain and three unique resort experiences. Heavenly delivers an unmatched high-energy vibe, Northstar offers Tahoe’s premier luxury experience in a family-friendly atmosphere, and Kirkwood is known for its authentic, big-mountain ski and ride experience.